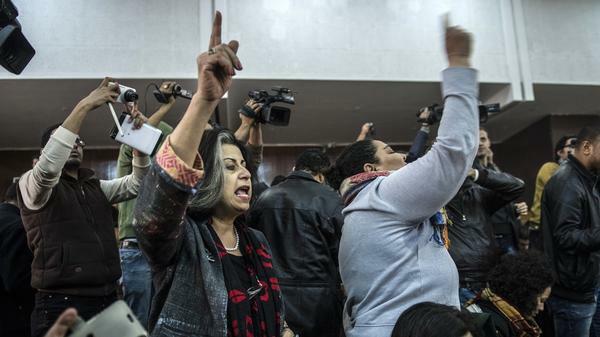 Relatives and supporters of Egyptian activist Alaa Abdel Fattah react after Monday's verdict in a trial over an illegal protest. A Cairo criminal court has sentenced prominent Egyptian blogger Alaa Abdel Fattah to five years in jail for violating a controversial law that bans unlicensed protests. Another activist, Ahmed Abdul Rahman, was also sentenced to five years on Monday. Eighteen other people were given three years, and several tried in absentia got 15 years. As the judge read out his verdict, the courtroom erupted in protest. "Down, down with military rule," activists at court chanted, waving to their friends inside the prosecution cage, pumping their fists in the air and applauding in solidarity. Sobs from family members filled the courtroom. The court decision in the retrial of the 25 defendants is the latest indication of the lengths to which the military-backed government in Egypt is willing to go to silence dissent, activists said. Abdel Fattah is a well-known pro-democracy activist who protested against deposed President Hosni Mubarak, the army, the ousted Muslim Brotherhood and now this military-backed government. And he's not the only pro-democracy activist in jail. Another prominent activist, Ahmed Douma, recently received a life sentence, and thousands of political prisoners — from secular to Islamist dissidents — are languishing behind bars. "In a way, we were prepared because the proceedings have all been a travesty of justice," Ahdaf Soueif, Abdel Fattah's aunt and prominent Egyptian novelist, said after the conviction. "But when it happens, it still takes your breath away." Nearby, relatives of the convicted hugged one another and wept outside the courtroom. Two of the men convicted were from the liberal Constitution Party. One is an American-educated father of three. "Why send more people to jail like this?" said Khaled Dawoud, a spokesman for the party. "People from the Mubarak regime, all the officers charged with the killing of hundreds, all these guys get released and our guys get between three and five years?" he asked. Earlier this year, Egypt's highest court overturned Mubarak's last conviction, allowing for his possible release. And human rights groups say barely anyone from Egypt's police force, accused of torture or the killings of peaceful protesters, are held accountable. "I'm angry," Dawoud says. "It just doesn't make sense."